I semi-recently bought a case of Bowman Chrome from last year, and aside from the scarcity of parallels (not one autograph was a refractor, and only ripped one gold refractor), there were 2 boxes without an autograph.So I figure I'll go to Topps' website, follow their instructions for missing cards, and e-mail pictures I took with my new camera I got for Christmas.Aside from me being the most ignorant camera/computer person on the planet, I finally figure out how to e-mail the pictures from the public library here to Topps only to have them bounce back.Alright, so I figure either they won't accept j.peg pictures or I have to resize them, right?So I thought.I have no damn clue on how to transfer them to pdf file as they state on their site, and Customer Service later e-mailed that they would accept j.peg files, so I have someone here teach me how to re-size the images.I drive back to the library the next day and e-mail the re-sized pictures and they don't bounce back.Cool, right?After all this aggrevation I'll finally get my missing cards.But, I check my e-mail on break this morning only to find out Customer Service didn't get the pictures I e-mailed, even though they never bounced back, and they stupidly want me to waste several dollars to send all the damn wrappers, and UPC codes back in (I made this mistake year's ago, the postage I spent mailing the crap back cost more than the garbage prospect autograph I got from them).I vowed not to make that mistake again, so I'm guess I'm stuck unless anyone else has any suggestions. 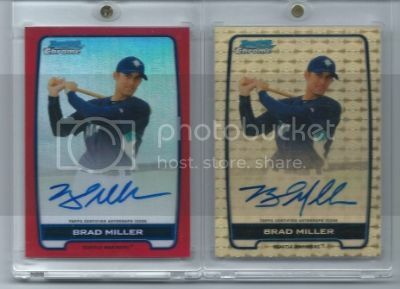 Anyone else have this problem?How would you trasfer pictures from camera to pdf file?If Topps didn't get my e-mails shouldn't they have bounced back?Sounds to me like Topps is full of it.Has anyone ever gotten any good prospect autographs back from Topps?Or all they always scrubs? I don't know why they want a .pgf but w/e. Use http://zamzar.com/ even if you're computer dumb you'll figure it out. Thanks for the help.Need any free cards? There's a Topps rep on here who may be able to help you. His username is DINANBBS so maybe you could PM him? Don't waste your time. I sent the wrappers in and they gave me the run around. Just cut your losses and move on. I always had positive experiences with Topps' customer service but this last episode was by far the worst. Normally, they send you base autos from the lower tier of players anyway. Yeah, spending all that junk in just isn't worth it.If they won't accept my e-mails then screw it. Appreciate the help.Anyone else on this thread need any free cards? I was missing the auto in a 2010 Bowman Chrome box. They accepted my scans through email and said to expect my auto card in 4-6 weeks. That was in early January. I sent them all my wrappers and the UPC from my box of 2011 Topps Magic Football because I was missing an auto. Only cost me a couple of bucks. It should cost you that much to send the required stuff. Your two trips to library in gas probably already cost you more. Next time just mail the stuff in. Oh...and you will get a scrub. Stop spending money on cards and buy a computer and scanner. What was wrong with them?I contacted an Amanda through e-mail, FYI.